Sable Island is sand bar – approximately 40 km long and 1.5 km wide – located about 200 km offshore from mainland Nova Scotia. Despite its isolation, Sable is home to a diversity of fauna including grey seals, harbour seals, wild horses (that were introduced to the island in the 1700’s), and a wide variety of bird species. Gulls, terns, and occasionally Leach’s storm-petrels, are the only seabirds which nest on this island. Both Herring Gulls and Great Black-backed Gulls breed on Sable, but detailed studies of these species have not been made here since 1971 when it was estimated that ~2000 pairs of Herring Gulls and ~600 pairs of Great Black-backed Gulls were nesting on the island. 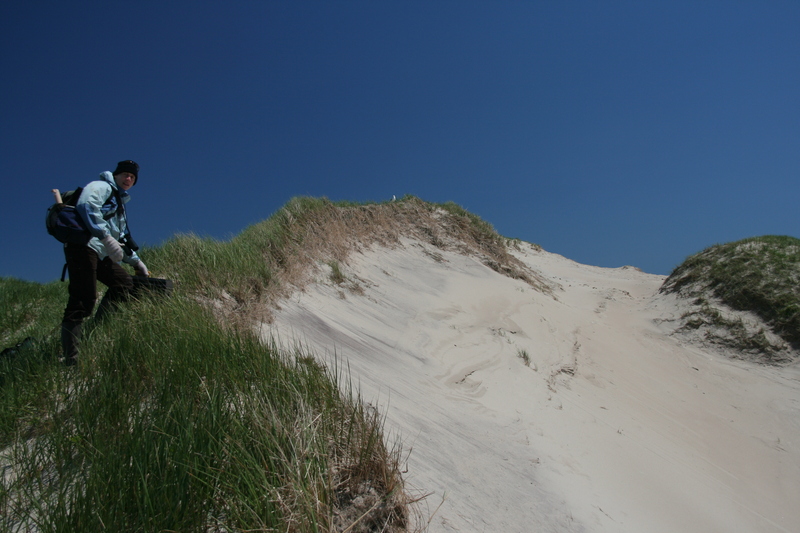 Ingrid climbs the ridge of a sand dune to reach a Herring Gull nest on top. Gulls on Sable nest in small colonies often on dune ridges and slopes. 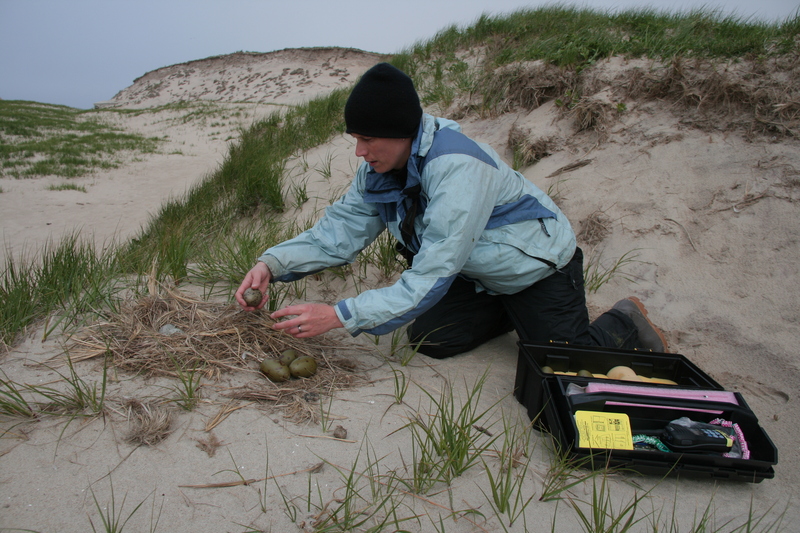 In June of 2011, a small team of keen biologists set out to Sable Island to initiate a new study of the gulls that nest on Sable. 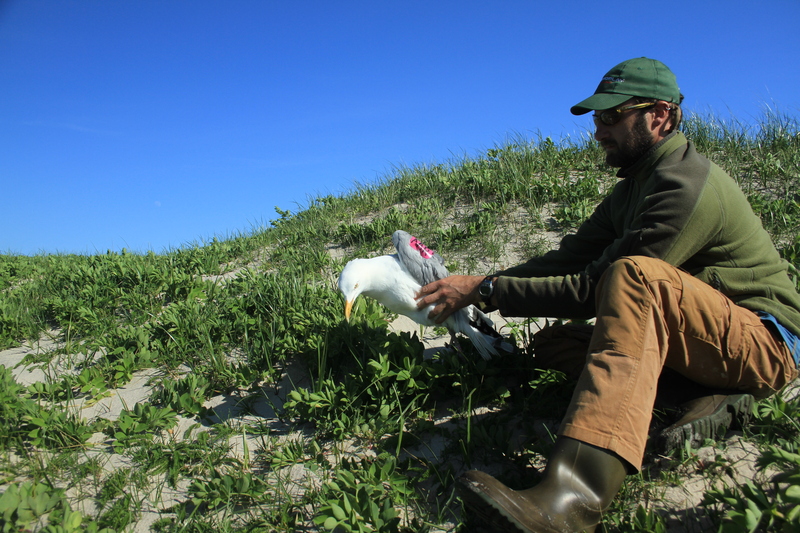 Rob Ronconi and Ingrid Pollet, from Acadia University, worked on Sable for 2 weeks catching and tagging gulls. We stayed at “BIO House” with grey seal biologists from the Department of Fisheries and Oceans who helped immensely with the logistics of working in this remote place. Eggs are temporarily swapped with "dummy" eggs to protect the real eggs during captures of nesting adults. At this time of year Herring Gulls were still incubating their eggs which allowed us catch them by setting traps over their nests. Catching gulls on Sable was easier said than done – the uneven and shifting sands made it difficult to set traps and the gulls were more skittish than on other islands where I’ve worked before. Many times we were duped by these crafty birds…gulls are much smarter than people give them credit for. Rob releases Herring Gull fitted with pink wing-tag "AAR"